Ikechukwu Aduba, former Delta state police commissioner, has insisted there is something more dangerous than the dreaded Boko Haram sect in Nigeria. The retired police officer raised alarm over the illegal activities of Fulani cattle rearers and urged the man incharge of the country, President Muhammadu Buhari to address the situation before it is too late. “It is a serious issue, more complicated than the terrorists activities in the Northeast. 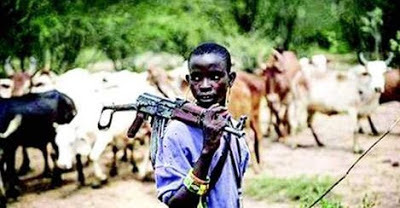 Boko Haram war is a minor issue when compared with what we are going to experience in the hands of Fulani cattle rearers in the nearest future if the issue is not addressed. “In some places, especially in Delta state where I served as the commissioner of police, many people cannot go to the farm anymore for fear of being attacked in the bush by cattle rearers. Many women have been raped in front of their husbands and children. Many people killed by the cattle rearers. It is a pathetic situation if cattle eat up people’s crops in the farm and the farm owner challenges them, it is a big problem. If the farm owner keeps quite, his toil for the year will be in vain. It is a wearisome situation. “The action is affecting agricultural businesses as communities are afraid to go to the farm for the fear that one day, all their labour for one year will be eaten up in one day by cattle. If a community is afraid that their loved may go to the farm and not return, how do you expect them to go to the farm where they may meet their untimely death? This is a serious and pathetic situation that is worse than Boko Haram. They will soon overrun the entire country. “I want to advice that President Muhammadu Buhari and the National Assembly should constitute a committee that would look into the issue. My suggestion is that the cattle rearers should be confined in gracing reserves and ranches. They should be made to stay in a particular area and not to wander from place to place.